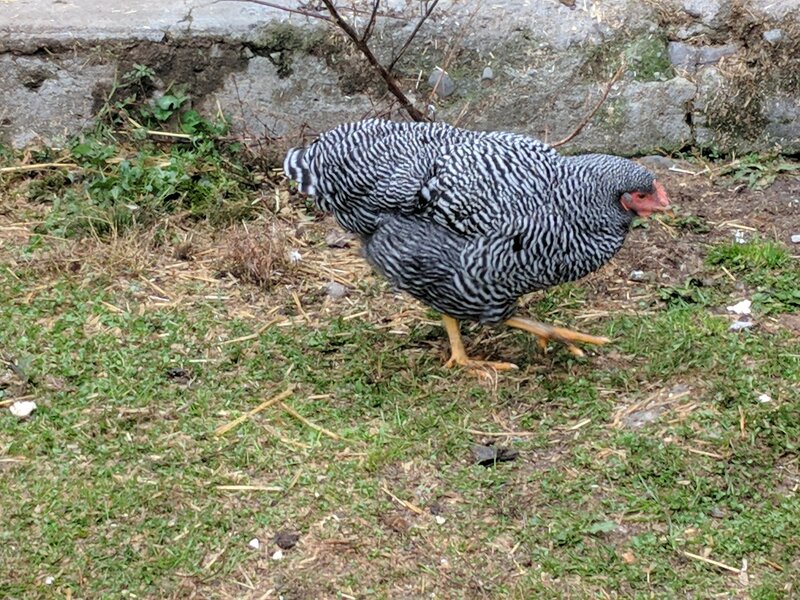 Occasionally when I go to the coop to be with my chickens, I have the opportunity to witness one of my hens laying their eggs. 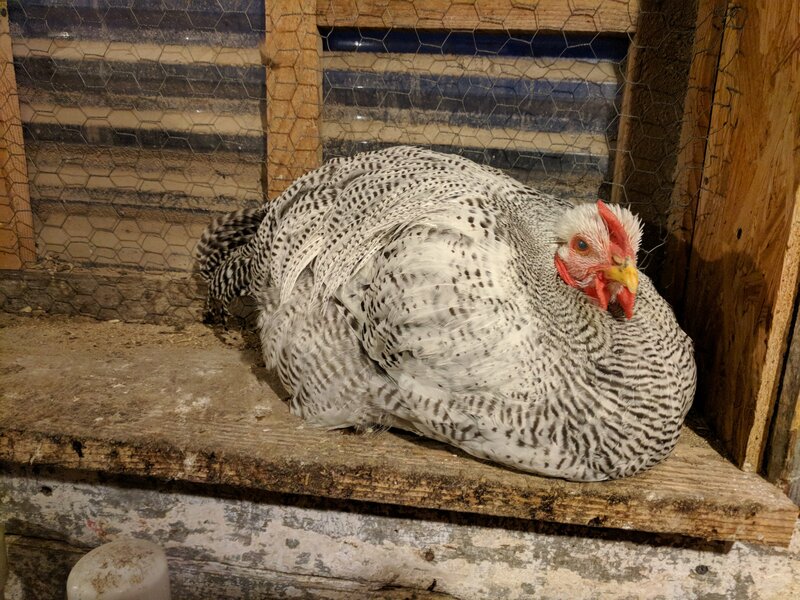 Such was the case three weeks ago when I witnessed my sweet, inquisitive Maicey laying her egg. 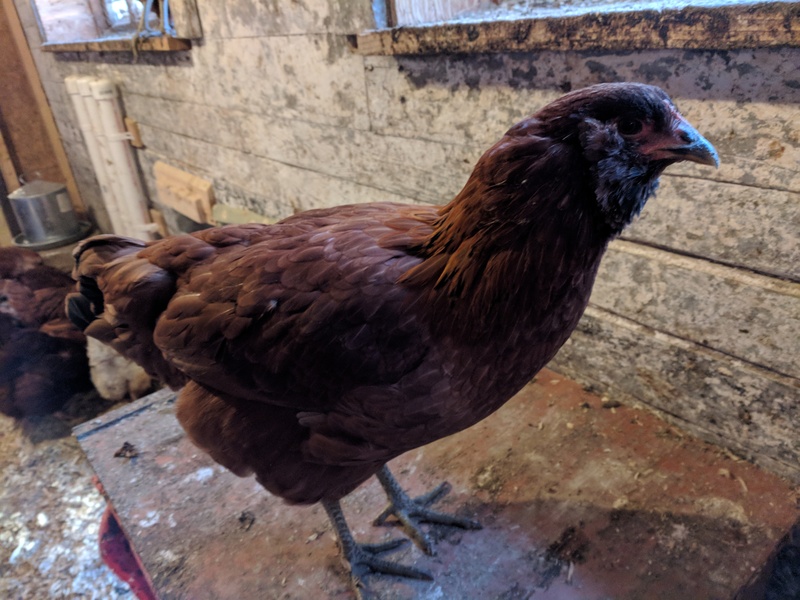 I had a broody hen (Briar Rose) whom I intended to give eggs to that night, so I picked up Maicey’s egg and tucked it away so it would not get mixed in with the other eggs. So I knew who that egg belonged to. When I gave Briar her eggs, I labeled them, and Maicey’s egg became known as #1. It is a tiny little baby, with red downy feathers, a small crested-looking head and, much to my surprise when I picked it up to say “hello” … slightly feathered legs. For those of you keeping score at home… I have three crested birds. Pavelle, the little Pavlovskaya, and her two children, Heather and Phillip. 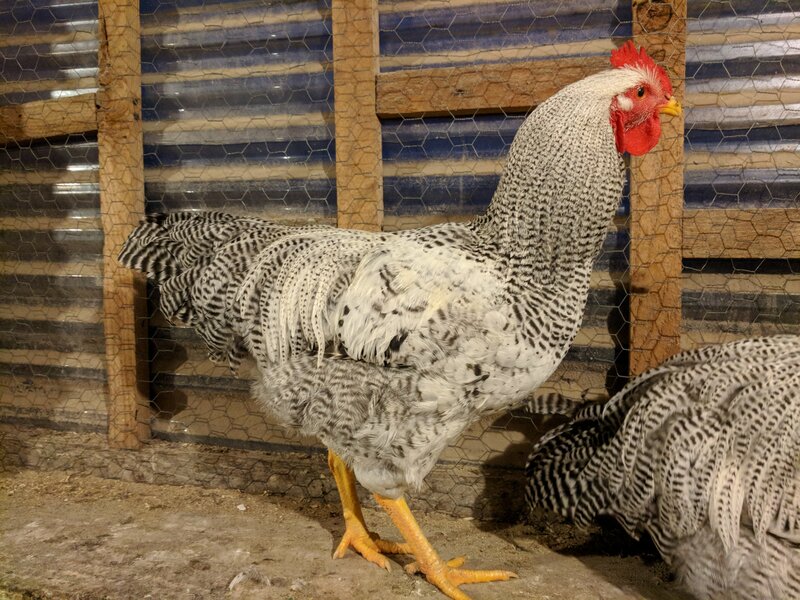 Phillip, who is Pavelle and Pip’s offspring, is the only rooster I have right now capable of siring a crested (or in this case, partially crested) chick. 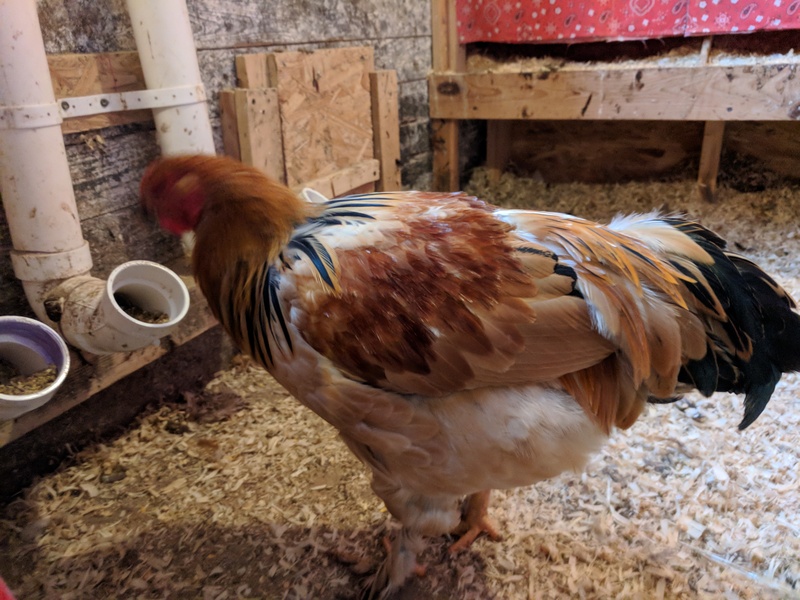 He is, himself, a barnyard mix of Pavlovskaya, Rhode Island Red and Golden Comet, which would make this little chick 2-parts RiR, Comet and Pavlov. With feathered legs like its Auntie Heather. I’m excited. I really am. Not only is Maicey one of our favorite hens, but this is also Pip’s grand-baby. You all know how much I love(d) and miss my little Pipsqueak. And Phillip acts so much like his papa. I’m so excited! There is one more egg we’re waiting on to hatch. I’ll let you all know how it goes in the morning. Or is it the Late Autumn Chicken Report? Because winter is almost here people. 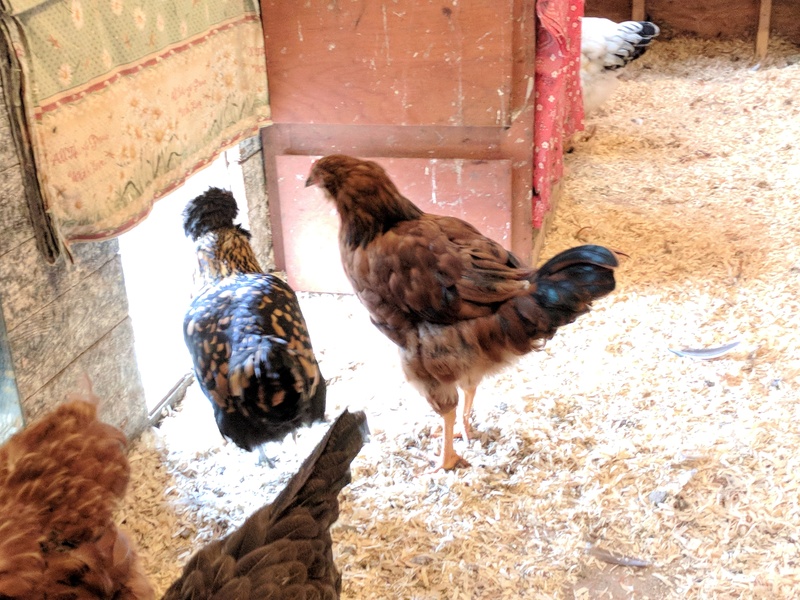 As reported in my last post, the chickens are in various stages of molt. They look pathetic, although some of the earlier molters are almost feathered back. Hopefully, the others will hurry up and NOT still be half naked by the time the snow starts sticking. October (or rather the end of October) meant the return of Halloween, jack o’lanterns and pumpkin seeds. I’ve always been jealous of pictures and videos of peoples’chickens pecking holes in pumpkins left out for them. Mine do not do that. They ignore whole pumpkins like the plague and even broken up ones, they would just eat the seeds and not the pulp. Pumpkin guts make a good chicken treat. 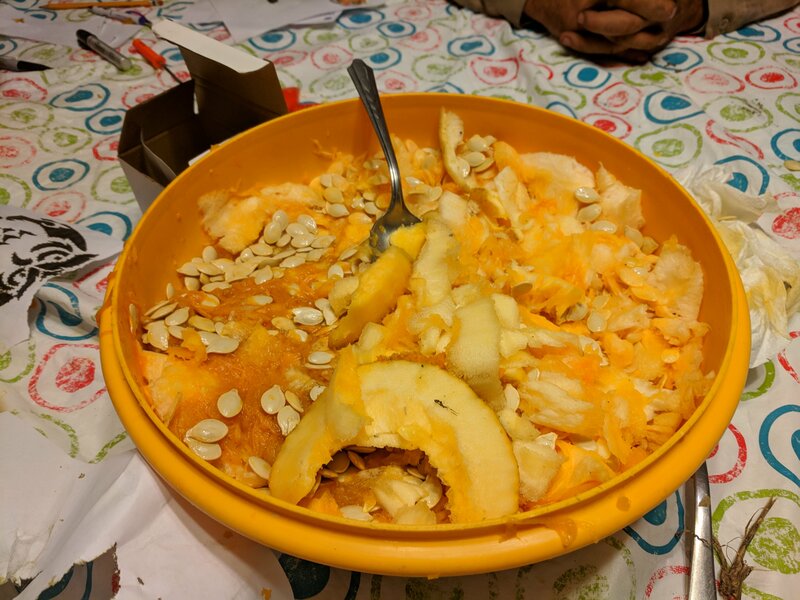 This year, however, they were more than interested in our post-Halloween offerings and devoured not only the pumpkin seeds and guts shown above, but six medium sized jack o’lanterns over the course of the first week of November. I am glad they enjoyed it, because in the next couple of weeks, I was tasked with the painful process of deciding which of them Summer Boys stayed and which ones were sent off to Freezer Camp. 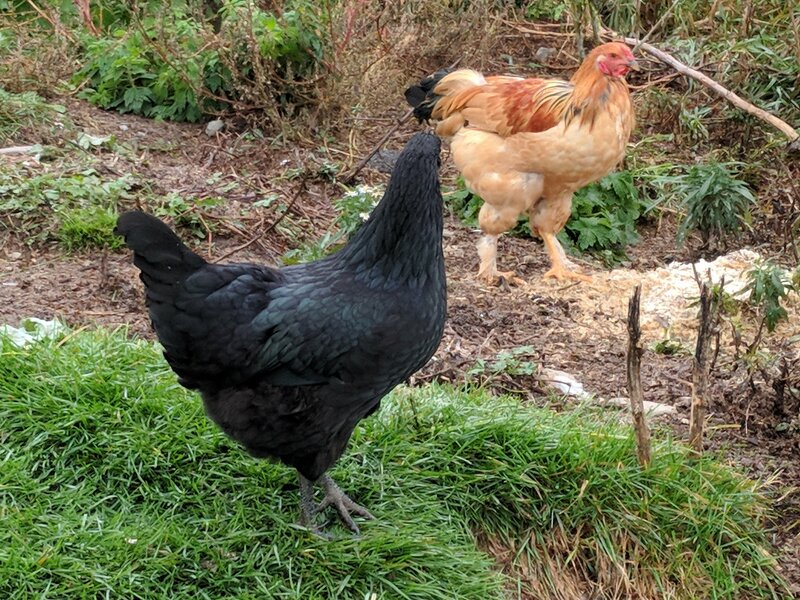 If you’ve read my blog before, you know that I have a general weakness for roosters. Between their beautiful plumage and strong, unique personalities, how could I not fall in love with the little buggers? 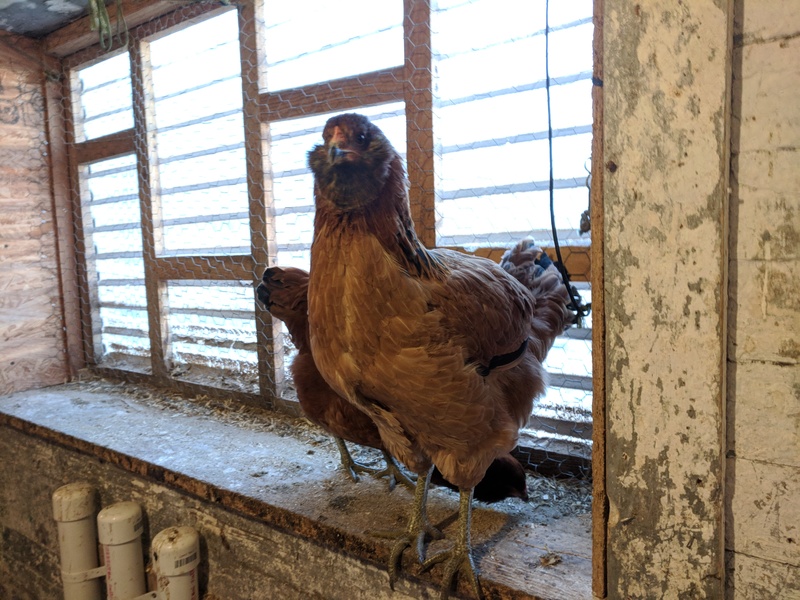 But every year, we hatch an average of 5-8 roosters and I’m only allowed to keep a minimum of three, depending on the size of my hen-to-rooster ratio. This year, including Dots and Luke (saved from last year), we had a grand total of eights roosters. 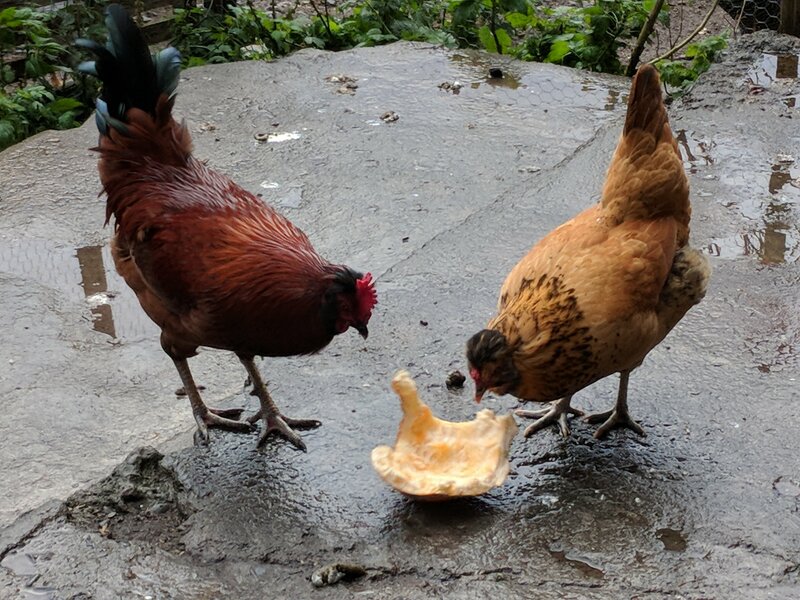 DH said I could keep three this year, if one of them was Phillip, the smaller rooster hatched out of one of Pavelle’s little white eggs. He is about half of Dot’s size and not likely to get much bigger. 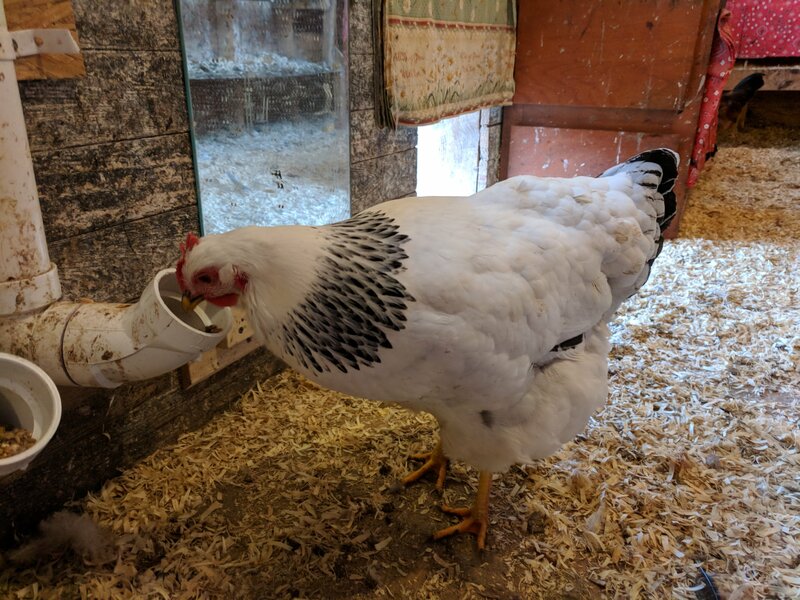 So while the chickens were blissfully enjoying the pumpkin treats, I was looking at my roosters, talking to them, interacting with them, and trying to decide who should stay and help Dots keep his flock safe. This is NEVER an easy decision for me, and the last time I had to do it, a mistake was made. I will probably never forgive myself for allowing DH to take Pip that day instead of Luke. I miss him. Everyday, I miss that little guy. He was our first chick ever and worked well his father and mother in taking care of the flock. Phillip (or Leapy as I call him sometimes), is Pip’s son from Pavelle and reminds me a lot of him, personality wise. So, before I go into who got tickets to Freezer Camp, let me introduce to the Summer Babies. 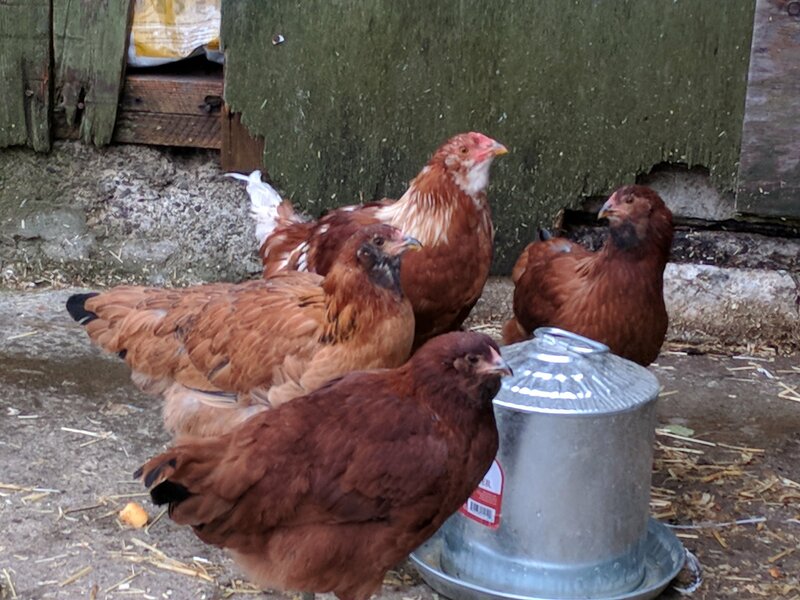 Of these, the roosters were Philip, Gus, Cutie, Sylvester, Apache and A.J. 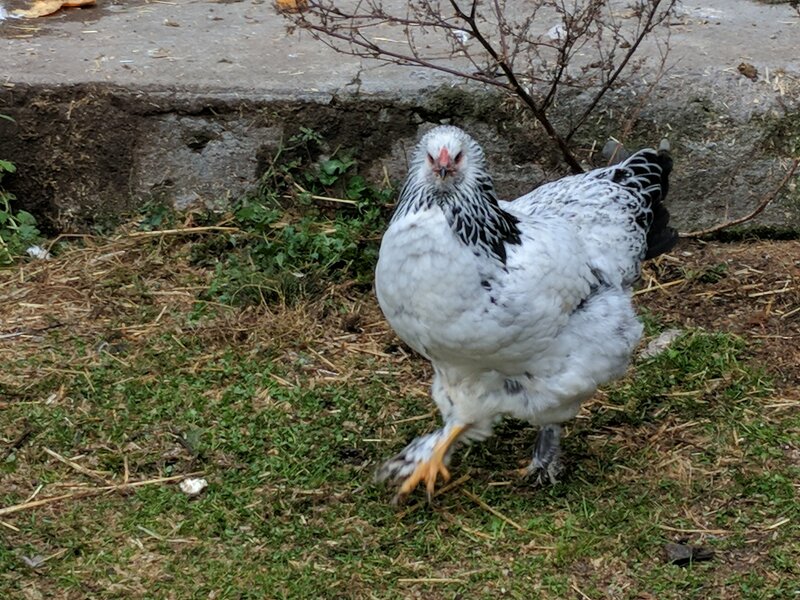 I have also thought at times that Darcy could really be a Mr. Darcy, but that one is either a late bloomer or a big hen. 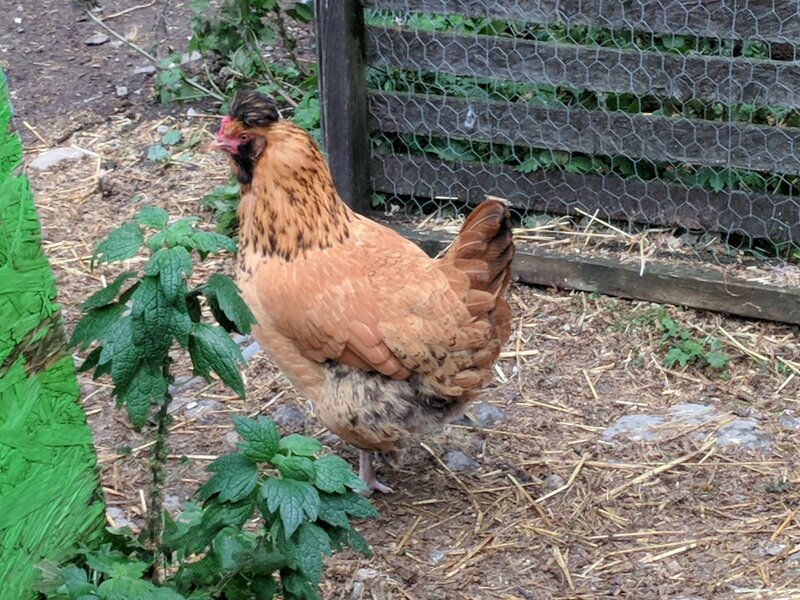 So we aired on the side of ‘big hen’ and kept Darcy, for now. She will winter over that will us time to see if she is really a he. Or not. This year, I decided to rectify the mistake of keeping Luke,making him first on the list for Freezer Camp. 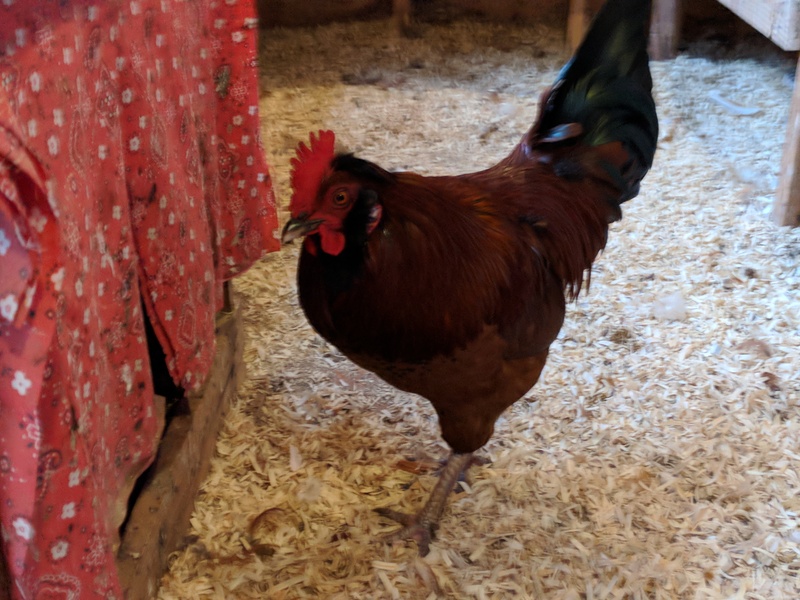 We would be keeping Dots (as usual because it’s dumb to get rid of a good rooster, and I learned that the hard way with Pip) and Philip… so I had a spot for one more keeper. 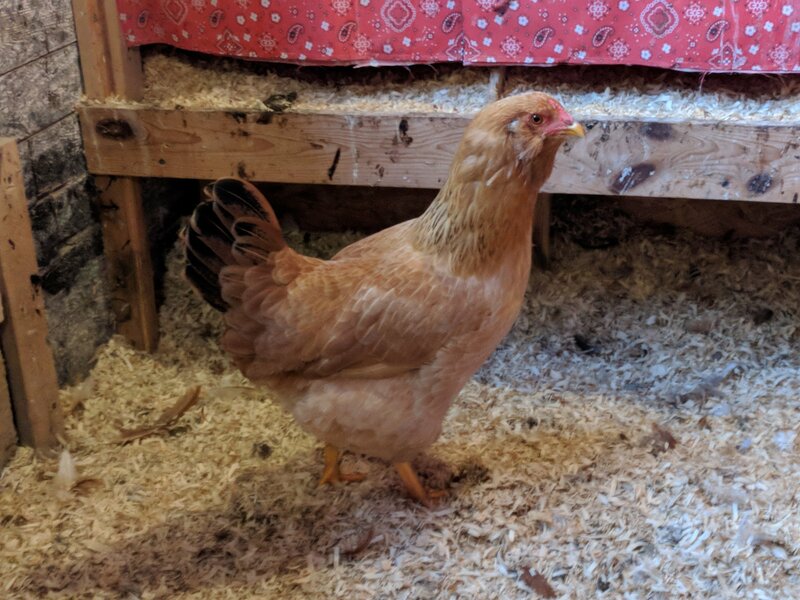 The candidates I was deciding from were Cutie ( a light barred rock from Little Dude’s incubator project) and Sylvester, the only hatched buff brahma. Of the Summer Boys those two were my favorites. Cutie because he was so incredibly beautiful and Sylvester because he was raised by my Tweety girl and has always been friendly. Like last time, I simply couldn’t decide right up til the end. What it came down to was which one could I pick up without too much hassle. Cutie always fights me until I got him in my arms. But then he would settle in. But he would still fight me. So on Freezer Camp day, I made the decision in favor of keeping Sylvaster and letting Cutie go. I hope that it doesn’t turn out like the Luke vs Pip decision. I really don’t. I couldn’t take that again. Incidentally, it really wasn’t “freezer camp” this year. We decided to can them instead and got 9 jars, 8 pints and 1 quart of meat out of them. They will be used to make soups and stews and maybe to grind up for chicken salad. The last thing we needed to do was give little Not Cocoa a better name. 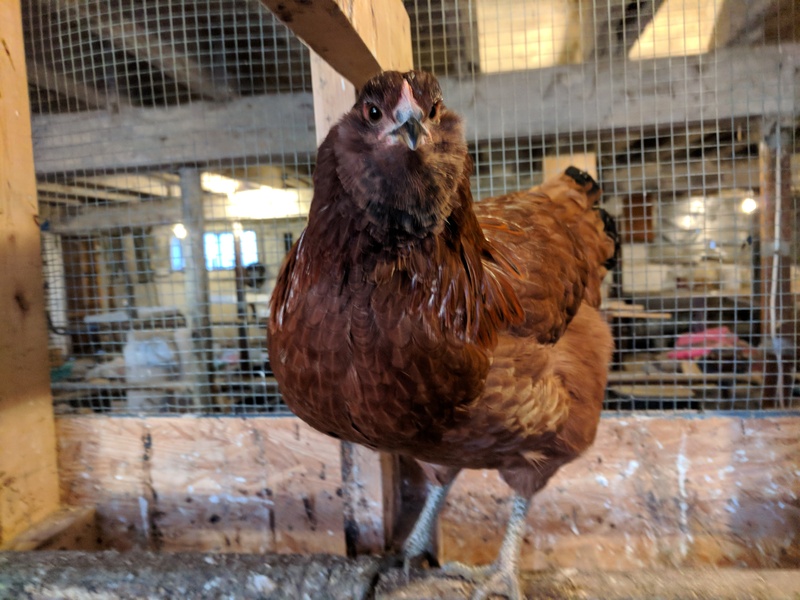 She is part Easter Egger (because Luke is her papa) and part Rhode Island Red. We called her Not Cocoa because we named Cocoa first and she is… not Cocoa. How hard is it to come up with a good name for me? I’m adorable! So we’ve been debating it a while, and finally, on Thanksgiving, we came up with a suitable name… Nutmeg. 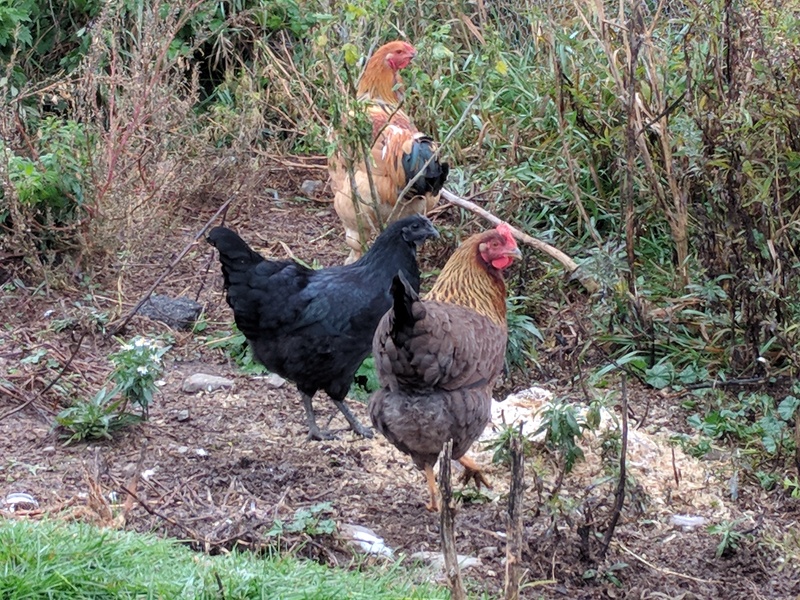 Lastly, I’ll leave you all with a picture of Double Dots and his ladies enjoying their Thanksgiving morning breakfast of oatmeal mixed with scratch grain, BOSS, meal worms and cranberries.